Cauliflower lollipop/gobi lollipop is a vegetable starter or snack which is very delicious with crunchy crust and softness inside. It has a unique taste and is a great recipe for vegetarians to enjoy as a starter or as a snack. Not used any artificial color and is done with completely healthy ingredients. 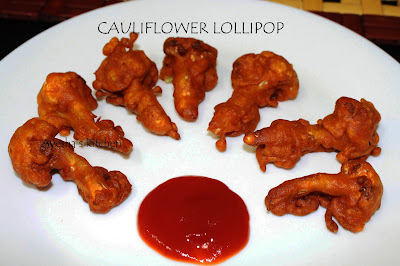 It looks same like chicken lollipop and it goes well in parties as a vegetarian lollipop. I was thinking of something new with this cauliflower / gobi my favorite veggie and very happy with this recipe. I prepared chicken lollipop and gobi lollipop for a party and it turns out well with a big hit in that party. An ideal snack or finger food for a get together or kids parties. Here is the recipe i came up with showing how to make vegetable lollipop / cauliflower lollipop / gobi lollipop. Combine together gram flour, corn flour, rice powder, soy sauce, tomato sauce, ginger garlic paste, kashmir chili powder, coriander powder and salt in a bowl. Add less water to make a thick batter and the consistency is same like Bhaji or pakora batter. Does not make too thin batter. Separate the cauliflower florets carefully along with its stem and set aside. Once hot, make the flame to medium and dip each cauliflower florets in this thick batter and put it in the hot oil. Do the same with the rest of the florets and deep fry then until crispy and golden. You can cover the stem with foil before serving.